Though the Victorian Era and the conservatism of the 1980s may have conflicted ideologically, even the Tories were charmed by the Pre-Raphaelites. I was re-reading John Berger’s Ways of Seeing recently while riding the 38 bus across London from Clapton Pond to Victoria Station. 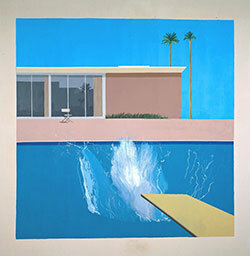 There is a seductive power to the Ways of Seeing, as strong today as it was when it was first published 40 years ago. The book conjures both the familiar and the new, as its ideas about advertising images, about the history of painting, about the image of women in Western culture, have seeped into our cultural psyche, whether we recognize it or not, shaping the ways we consider the visual surround of our lives. In talking about the invention of perspective in painting, Berger concludes his usual aphoristic precision: “The visible world is arranged for the spectator as the universe was once thought to be arranged for God.” This position of looking, even more acute today in our internet lives, collapses the space between the image and ourselves, such that all images are ultimately about us, about attracting a spectator. 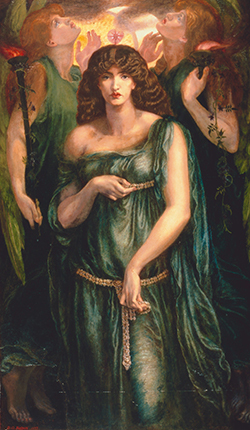 “Pre-Raphaelites: Victorian Avant-Garde.” Through January 13, 2013. Tate Britain, London. February 17 through May 19, 2013. National Gallery, Washington, D.C. Gathered from a series of talks on BBC radio, the book is certainly of its moment, its ideas set amidst the social protests and violent conflicts of the late 1960s. (It came out months after Northern Ireland’s “Bloody Sunday” when 30 protesters were shot dead by British troops, and just a few weeks after the first female students entered classes at Cambridge university for the first time). Its title reflects as much on this moment of social change as it points us to consider how such changes are deeply embedded in the act of seeing. For Berger, seeing itself is part of the structure of power. But reading Ways of Seeing on a bus across London was an odd preparation to see a new incarnation of the Pre-Raphaelites on display at the Tate Britain. Berger is completely silent on these Victorian artists. There is not a single reproduction of the better-known paintings, even in those mesmerizing sections of the book where the reproduced images, juxtaposed with one another, are meant to speak for themselves. While Berger’s reflections on Western art point more often to Renaissance and Baroque paintings, there are a few 19th century works included, but they tend to be of French painters, Ingres and Manet for example. I thought it strange that for a book that began, as a BBC series didn’t point to at least one Pre-Raphaelite work. In fact, looking through the list of paintings in the back of the book, there isn’t a mention of British painting after Victoria takes her thrown in 1837. As the bus rolled into Victoria Station, I wondered why the Pre-Raphaelites didn’t deserve Berger’s attention. 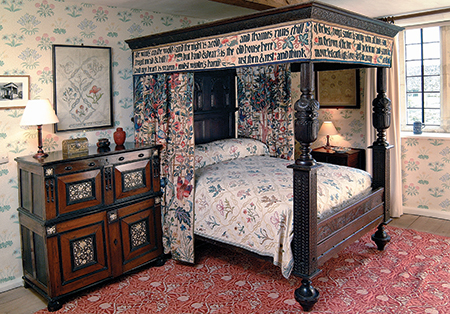 This expansive show of nearly 200 works, including tapestries and carpets, and even a full-sized bed by the craftsmen and socialist William Morris, is the first retrospective of this Victorian arts movement since Margaret Thatcher was Prime Minister. Indeed, the last time these works were assembled at the Tate Britain Thatcher herself was at the opening, touring the galleries with a pleasing smile and wearing a well-tailored black dress with delicate lace sleeves. The Tories found comfort in the Pre-Raphaelites no doubt, in the seductive charms of these paintings with their rich colors and precise details of wealth and abundance, all cast in scenes of chivalric myth or Shakespearean tragedies, tinged with Victorian morals. Back then, in 1984, few were considering the socialism that were smoldering inside these artists — hotter in some than others. But then, even critics of that earlier show were dubious of the socialist idealism of William Morris, the movement’s patron saint, calling it more an escapist fantasy rather than a political force. 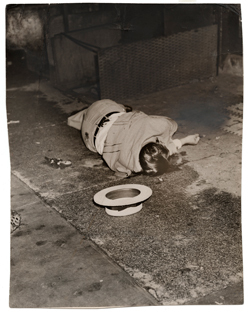 This new show attempts a much different story of these artists, one of radical innovators who deserve their place in the origins of modernism itself. The Pre-Raphaelites had “a self-conscious, radical project of overturning artistic orthodoxies,” says the introductory wall text. The word “radical” comes up often in the wall text and catalog essays, making the word as diaphanous as the fabrics that flow through these works. This spin on the Pre-Raphaelites is a hard story to tell, and even the curators seem a bit dubious about it. 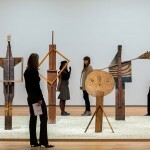 While the show is certainly expansive with seven galleries of closely displayed works, there is little new about this movement that comes through here in either the paintings or the artists themselves. Founded in 1848 with the Medieval-guild-sounding name of the Pre-Raphaelite Brotherhood, the group, consisting of young art students John Everett Millais; Dante Gabriel Rossetti; and William Holman Hunt, sought to recover the aesthetic traditions (and social values) of art before the era of Italian Renaissance painter Raphael, an icon of art school education at the time. In aesthetics they reached back to the Italian early Renaissance, or, more often the style of Flemish painters of the same era. The group would develop a constellation of artists and craftsmen working in other 19th century trends of Aestheticism and the Arts and Crafts movement, which was lead by William Morris and Edward Burne-Jones. 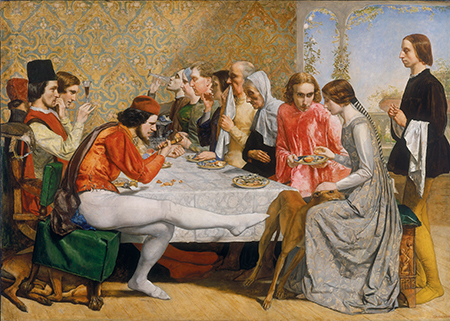 In this way, the Pre-Raphaelites were part of a cultural and artistic reaction against the muck and excess of Britain’s industrialization and empire building. While this historical context haunts this show, it never really plays a part shaping a story about the Pre-Raphaelites. Rather, we get a familiar history with a familiar cast of actors, and small gestures to socialist ideals. Aside from claims of the group’s departures from the art academy protocols (which were true) and how their art was decried by critics at the time (also important), the show offers a fairly conservative structure with section titles such as “History,” “Nature,” “Beauty,” and, oddly “Salvation” and “Paradise.” These didn’t sound very radical to me. Despite these arrangements, there is much to enjoy in this show, which features many of the better known Pre-Raphaelite works. “Mariana” (1850-1) by Millais, who remains the most accomplished of the artists here, presents a intimate scene of the Shakespearean character as she rises from her work table, arching her back, staring off into the stain-glassed window towards the autumn light. The photographic precision of the painting is startling, a moment seemingly not posed for the painter but rather composed as if caught spying. While this painting is put in the “History” gallery, Millais’s other well-known Shakespearean scene “Ophelia” (1851-2) is put in “Nature.” The categories start to blur in their importance by the second gallery or so, and you realize that the sections are quite arbitrary. But there in “Nature” Ophelia rests, that haunting image of her body floating in the stream, her face white and frozen, her mouth slightly open, palms facing upward as if resolved with her fate. She is indeed surrounded by the richly detailed lushness of forest plants and shrubs, all rendered with the care of a botanical illustrator. But I was again struck by the intimacy of the image. Like “Mariana,” this painting is composed at an angle as if you were walking along a path and just happened upon the tragedy. We encounter this intimacy in many paintings — a kind of composing that draws you into the moment with casual theatrics. Take Ford Madox Brown’s “Jesus Washing Peter’s Feet” (1852-6) that turns the biblical scene into a near cinematic moment. Peter’s foot, wet and wrapped in fabric enclosed by Jesus’ hand, centers the entire composition, which spirals outward to spectators and guests, all shadowed in the far distance, beyond the thick white table cloth. Brown puts us down with the action, kneeling there just to the right of the well-toned Jesus, as if we had front row seats. 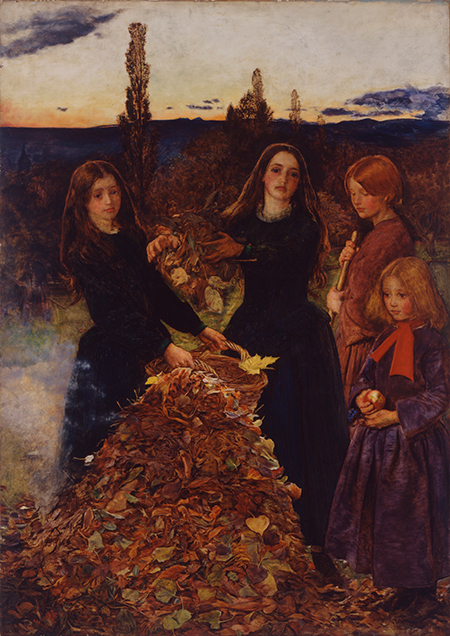 Millais’s “Autumn Leaves” (1855-6) (strangely in the “Beauty” section), captures a frozen posed moment of girls gathering leaves, their actions caught in mid-movement while they regard us as if to say join us here. 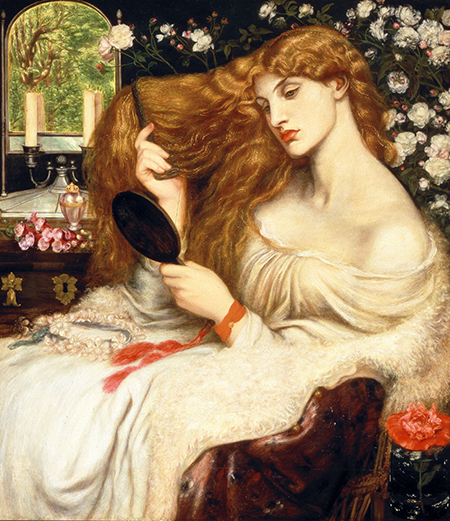 Look also at Dante Gabriel Rossetti’s work “Lady Lilith” (1866), whose title figure sits combing her hair, admiring its sheen in a hand mirror, while around her flows the satin cover of the arm chair, clusters of white roses branch out behind her toward a mahogany chest, which holds a silver framed mirror and nearly perfect candles. Such compositions and details reflect a photographic influence, where the artists were using the paint to capture an intimate realism that the newly invented daguerreotype challenged. What strikes you again and again in these paintings is how cluttered they are with objects of material wealth: Italian Renaissance silver bowls, Indian silks, cherry wood tables, Turkish rugs, Venetian glass, and layers upon layers of richly colored fabrics that seem to flow with endless breezes. Even when the scene recreates mythic tales of Medieval life, the material objects that fill the canvases, like the lush and languid bodies themselves, are very much products of Victorian empire. Perhaps this is why the industrialists of the era so much admired these paintings, and were often the main patrons of the Pre-Raphaelites. In their catalog essay, art historians Tim Barringer and Jason Rosenfeld note that “Pre-Raphaelite painters looked for patronage from the newly prosperous and confident middle class of mid-Victorian England” and found in this new class an admiring audience. One active patron, Thomas Fairbairn who owned a thriving engineering company, commissioned a number of paintings and supported gallery shows in his native Manchester, even as he was engaged in fierce and violent battles with his workers over salaries and the conditions of his factories. While this is often the story of art and industry in the 19th century (think of Andrew Carnegie’s treatment of his workers as he was building museums and libraries), I wondered what about these paintings were so admired by the industrialists of Manchester and Birmingham, of Newcastle and Liverpool. Was it the idealized mythic past that these paintings present, with their cluttered intimacy of bourgeois domesticity. Look at Millais’s “Isabella” (18480-9) created when the painter was barely 20. Capturing a dining scene taken from a Boccaccio story, the painting recreates the drama of a Florentine merchant family’s impending violent response to their daughter’s illicit affair with a lowly clerk. But our eye is draw to the textures of fabrics, and flow of velvet and silk sleeves, the sumptuous folds of Isabella’s dress, and the fine designs of the wallpaper. The dinner guests, most seemingly caught in their own private concerns, are more props to the clothing and objects of the painting. Here, as elsewhere in these works, the past becomes a useful frame for an image of the present, as for both the artists and the patrons, such works offered an escape from the blight of Victorian England, from overcrowded cities, from horrible factories and congested mines, from the cutting iron tracks of railroads across the natural landscape. If the artists found in the past an aesthetic richness of craft and color, the industrialists embraced these paintings as they turned the objects of Victorian wealth and empire into precise scenes of myth and legend. In a sense, these paintings present a series of romantic ideals for both artists and patrons, where their beauty and details turn into their own otherworldly reality. The technique of mixing pigments with oil had existed since the ancient world. But the oil painting as an art form was not born until there was a need to develop and perfect this technique (which soon involved using canvas instead of wooden panels) in order to express a particular view of life for which the technique of tempera or fresco were inadequate. Throughout Ways of Seeing, Berger is having a pointed argument not only with the conservative art historians. He is also challenging us to reconsider our experience of images. “If you buy a painting,” he writes, “you buy also the look of the thing it represents.” This look of the thing turns the canvas into a more complex surface of, well, surfaces. Up until the late 19th century with Impressionism, so Berger argues, oil painting reduced the world to objects of the powerful, who were often the patrons and subjects of such works: painting and identity were conflated. It is not simply aesthetics that matter for Berger, but also how the aesthetics shape a way of organizing the world.